Compost piles are a wonderful thing and they make great compost if you actually maintain them…. or you wait 2 or 3 years. Well, I currently have no place to let a compost pile sit unnoticed for 2 or 3 years and my track record for maintaining a compost pile is very bad indeed. I once had a wonderful turban squash vine grow from my poorly maintained compost pile. It climbed a nearby tree and produced 3 lovely orange squashes hanging from a limb like party lights. That was fun. But back to my current solution for fertilizing my garden while recycling fruit and vegetable scraps all in one fell swoop…. Cold composting is the fastest way to get the scraps back into the ground in a form that plants (and worms) can use. Basically you are making your scraps so small that they are almost instantly part of the soil. All you need is a blender. I do my cold composting in a Vita Mix which is a very powerful blender. You may have to leave out the green pepper stems/ cabbage centers, etc. 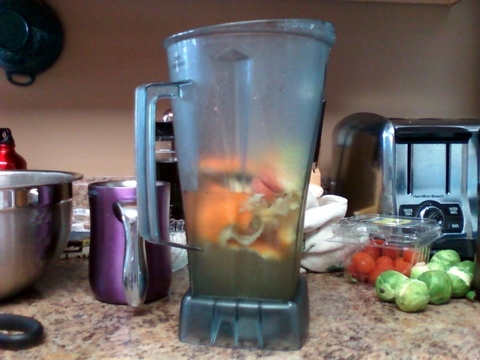 if your blender is not real powerful, but chopping smaller and putting enough water in the blender also helps disintegrate the less willing participants. Then when I am cooking/peeling/chopping/ producing leavings of the plant variety, I set the container on the counter or in the sink where I am working and plunk the ‘garbage’ right in (leaving a little for Lenny & Squiggy the guinea pigs). When it’s almost full, I add some water to ease the grinding and the pouring, warn people nearby of impending blender noise and let it fly until all is smooth and small. I have a tamper with my VitaMix that works through a hole in the top. You may have to stop and move things around, but if you have enough water in the mix, it should all get chopped and mixed. Make sure you offer your children, spouse, partner a garbage smoothie first, then take it out to the garden. Work between your rows and scrape a top layer of soil or mulch away making a long shallow trench. I usually use 1-2 blenderfuls for an 8 foot length in my raised beds and do that 4-5 different places in the same bed. Pour the garbage smoothie into the trench. It’s okay to be close to plants, just don’t slop a bunch on them or dig up their roots. Cover the furrow back up then go cook and eat more so you can make another one! I am particularly sure to include eggshells in every batch as I tend to get blossom rot on tomatoes otherwise. I also compost coffee grounds and filters, although we use a single cup coffee pot which uses a small filter and a couple of Tbsp of grounds – not sure if it would be too much grounds if you used a whole pot size dose. One of the biggest surprises to me in this process was how quickly the compost disappears. Although I can still see tiny bits of eggshell for a month or more, the rest of it blends right in with the soil in a matter of weeks, so by the time I’ve fed my four 8X4 raised beds, I just go back to the beginning and keep building rich, dark soil that fosters healthy plants that more easily withstand the onslaught of Middle TN bugs, diseases and late summer drought. And let us know about your composting adventures! This was shared on Tuned In Tuesday Blog Hop! I LOVE LOVE LOVE this idea. I have been doing this recently as well and it has revolutionized my composting willingness. I have a bin out there and frankly, I am a LAZY composter. I should turn it; I don’t. I should balance my greens and browns better; I don’t. So out there I have a big bin full of half digested and very old compostable bits. 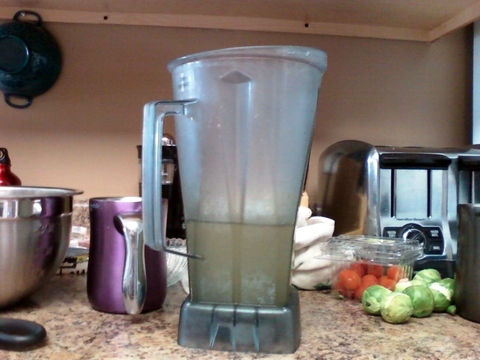 So time will deal with that mess and in the meantime I am blending my way to better soil and a cleaner kitchen! We don’t have a compost pile except for the chicken manure which is next years fertilizer. With all sorts of woodland varmints ransacking a compost pile, it’s not really an option for us since we don’t wish to attract scavengers to the property. HowEVER, this idea of yours is clever! I like the idea of blending a smoothie, digging a trench and covering up the concoction!!! What a CLEVER idea! I’m subscribing to your blog on this very post! Tonight I’ll be pawing through the archives to see what other dandy ideas you have! Thanks for sharing. You are most welcome littlesundog! We’re so glad to have you aboard : ) Oh and I can’t take credit for the idea, although I honestly can’t remember where I first heard of it and have since adapted it to work for me. How absolutely, stunningly clever! We don’t have the space or time problem, but I still might try this just for the fun experimental factor! It’s pretty irresistible in its simplicity, right? And so great for impatient composters like me. Let us know how it goes! What a fantastic idea! Does anyone ever take you up the offer for a sip? I am going to Tweet this and would love if our residents try this one here in Halton Region. Tweet Away!! It really is such a flexible way to compost. As of yet, no one has taken a sip of the garbage smoothie, but it usually gets a smile out of my 11 year old who is becoming too cool for some of Mommy’s humor, so it works for me!! This is a wonderful idea that I will surely try. My husband can’t stand the “rotting mess” so this way it will be outside, in the ground, feeding the worms immediately. What a wonderful idea! I will admit to being extremely lazy, we don’t even have a compost pile. I dump the peelings and stuff into a Rubbermaid tub and when it’s full we just dump it in the garden! I suppose once it gets tilled in a couple times, it disappears. Stopping by from Natural Living Monday! Hey – whatever works right? This isn’t too labor intensive and it gets me out to check on things / pull some weeds, etc. So glad you stopped by! I will have to try this! Thank you so much for the tip. I’ve never been good at composting either. I’d love to do more with composting and it should be easier with all the summer produce scraps! I love the names of your guinea pigs – made me chuckle! Love this idea!! Do you find that any little critters are more attracted to your garden when you do this? We already have a rabbit problem, and don’t want to give them more reasons to visit our garden 🙂 we do have a compost pile but honestly I love how quick and simple this method is! I was just saying the other day that I wish we had a giant blender to take our slowly decomposing compost pile and chop it all up. Never thought of this though! So glad you like the idea! My favorite way of keeping rabbits out of the garden is to mix a little human urine, a little dish soap and a little ammonia in a pitcher of water and pourit aroud the perimeter of the garden. It must be renewed fairly frequently but it keeps the rabbits out! (OR if you live in an area where a male helper can just go make a line around the edge, that works as well 😉 Lenny & Squiggy keep us amused in many ways!! I just realized I mis-read your question. I do not think this attracts rabbits… but it sure attracts worms! And that’s a wonderful thing. Unfortunately, the worms attract moles, but we have a general problem with moles here in Middle TN, so not sure they wouldn’t be a problem anyway. The urine helps keep them away as well! This is a fantastic idea! I have a tumbling composter in the backyard, but we tend to empty it during spring planting. I’ll have to use this method to get compost nutrients to my plants in the summer. Thanks! I also wanted to invite you to join my How To Tuesday link party, if you haven’t already joined . It would be wonderful to have you! Thank you Katie for the invite Katie, we’re linked up. It looks like a good party 😉 It feels so good to send those scraps right into the ground! This is great and I pinned it for future reference! Thanks for sharing…popped over from Whatever Goes Wednesday! Thank you for the pin LUisa and so glad you like the idea. It has saved me money on fertilizer and composted manure and saved me time in pretending I’m going to compost outside and make it work! Hmm, bliltz it in the blender or bury it in my already waiting compost pile…. Same amount of effort for me, but in the winter, maybe a litter warmer! I usually just throw everything in and cover over it deep enough that the critters would have to really dig for it. 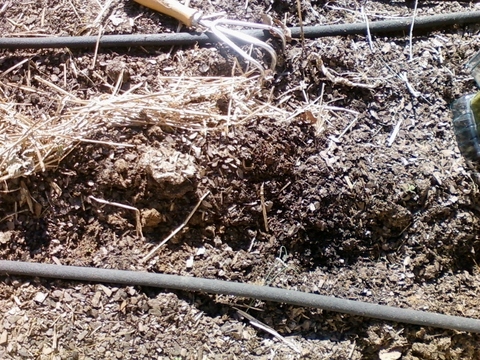 This is also my version of “turning” my compost which k-ster and my father say I never do and they are dying to “turn” it over with the backhoe. We all know how that will end up so I make them stay away!! LOL – Backhoes require wise application, don’t they? Glad to hear someone out there does a good job with the compost pile. Someday I will manage! Thanks for stopping by! Thank you so much for the information. Sounds easy. I want to learn more about composting. You are welcome! Such a cheap and green way to keep your garden healthy. So glad you stopped by! This is a great idea! I am sure my husband would gag if he saw it though lol. I like it better than the compost pile in the yard. Ill give it a try. Thanks for sharing on Natural Living Monday! 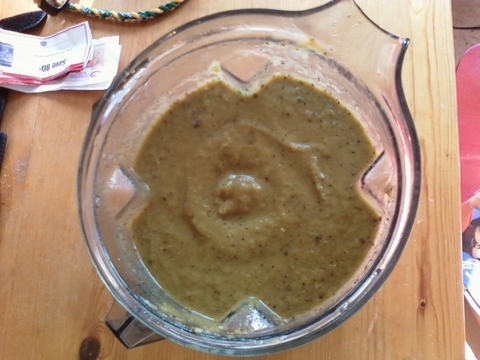 Great idea to make compost puree! Nice post. I’m definitely going to do this. I’ve been putting all my scraps in the freezer. Now I won’t be giving them to my farmer frien d any more! Thank you. 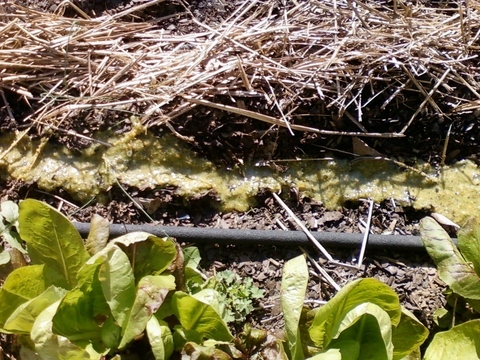 i won’t be able to get to my garden for another month and a half…can i just freeze this slurry in batches for when i get there? instead of putting around existing plants how would you use it as a general soil ammendment, spread it on and turn soil over? WHAT a BRILLIANT idea!! I live in Middle TN so I can go ahead and put it in the ground most of the winter – just a few spells where the soil is frozen too hard or covered in ice or snow, but if you can’t and have a big garden – why not? Thanks for sharing your idea! Thanks! We’d be delighted to come to your blog hop! Thank you Loriel for hosting! You are very welcome. In particular including egg shells has been a boon to my garden, preventing blossom rot. Thanks for hosting! I was thinking that blending the kitchen scraps and then pouring them on the leaves etc. in the compost pile might speed things up a bit. Do you think that would work too? I’ve done that Stacy and it totally speeds things up! This is such a good idea! Once I begin gardening I’ll have to remember this, so I’m pinning it to my dream garden board! I would love if you linked up to Seasons on Saturday Link Party going on right now!! Thanks Abbi! We’ll check it out! We started doing something similar this year. The process is called Trench Composting; you can google it to read more about it. 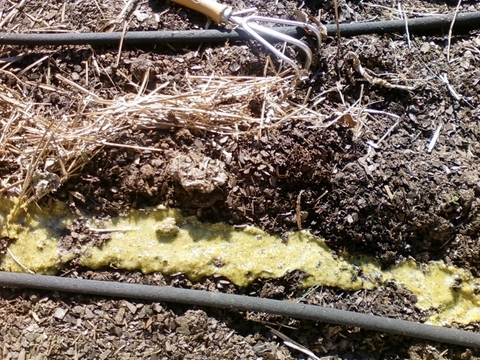 I might consider the slurry idea for my summer trench composting, when the beds are all planted and root systems are too extensive for a big trench, but for the fall and winter and spring, a big trench is an easy way to do it, even when you don’t want to make a garbage smoothie. 🙂 But to each their own preferred method! Thank you! That is very interesting input. Faster is always better! I might have to try that myself, although I imagine the slurry method allows you to put more in the soil as it is usually gone within a couple of weeks and I just rotate spot to spot where I put it. Thanks for sharing! Thank you Kelly! It saves me money on fertilizer, helps the plants and keeps the trash heading to the dump less as well. Thanks for stopping by! In the dead of summer there can be a bit of an odor for a day, but it is not strong and I certainly don’t think it reaches the neighbors. Doesn’t even reach beyond the general vicinity of my garden! I’ve been doing this for my worm composting bins and it has eliminated the rotting stench of lingering cabbage leaves. Thanks for validating my method! Sugoi! That’s Japanese for Awesome! I live in an 8th floor apt…with a small balcony. Tried to compost last year…let’s just say the trash bin I used and all of it’s smelly contents are now down in the parking bay!!! Maybe it’s turned to compost by now, LOL! I love my Vitamix and I HATE throwing away compostable stuff…I saw a Squidoo on a Tiny Compost Tumbler…but I had so much veggies I blended them and put them in the container…now what? Do I tumble it for weeks? How many containers will I need, each at a different stage? Etc, etc, etc. THIS is a great idea! Now I’ll need to grow more stuff, they’re going to be so happy and fed! ARIGATOU GOZAIMASU…THANKS!!! You are welcome Loretta! So lovely to hear a success story. I initially started just crushing up egg shells to put at the base of my tomatoes to stop blossom rot and it built from there. No more blossom rot and it is so fast. I’ve got my son applying the garbage smoothie to the garden now. Nothing like team work. Good luck with your garden! 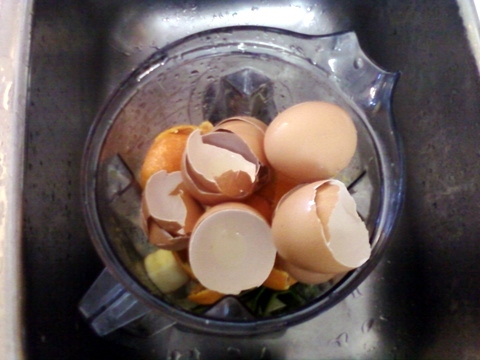 Do the egg shells scratch the blender container? I tried blending water, coffee grounds, and egg shells in my Vitamix to pour in my garden and my container is now cloudy because of the egg shells. That bummed me out. I know that you keep a container for just this purpose so I’m sure this is less of a concern for you. You know I hadn’t noticed and maybe that is because I do use the extra container that came with mine for composting. My Vita Mix was also already quite a few years old when I started doing this and so probably already scratched up – I put all manner of ridiculous things in it! distinctive about my problem. You’re amazing! Thank you! I used to do this all the time for my garden and it works out great! Similar to what I do, but my smoothies go to my wormies in my basement. I always add their favorite, banana peels with bits of bananas. Keeps them fed during the winter. Vitamix uses tremendous amount of energy and if your goal is to decrease carbon footprint by composting are you really achieving your goal? That is an interesting comment Punita! Never thought of that. Will have to research that a bit! Thanks. can you compost yogurt, cottage chees and milk?? I have always heard that you shouldn’t compost animal products because that will attract rats and perhaps other unwanted visitors to your compost pile. Would probably also smell for a bit, but I have heard of people doing it. I do not. Thanks for stopping by – sorry not to have a more definitive answer for you! Great idea!! Thanks for sharing on My 2 Favorite Things on Thursday!! Hope to see you tomorrow!! Pinned!! Love this! We have a composter that we fill with all of our veggie scraps, coffee grounds and egg shells, we use it up in the beginning to mix into our beds, but this is a great way to feed the garden all summer long. I can still load the composter for next year too! Pinned! Thanks for sharing! Thank you for the pin! I have been so pleased with this method 🙂 So glad you stopped by! I have heard of compost but was not sure what it was. But then again, I am limited in my plant knowledge. An interesting smoothie for plants I must add! Thanks for sharing at Home Matters linky party. What a great idea!! Thanks for sharing on My 2 Favorite Things on Thursday – Link Party!! Hope to see you again tomorrow!! Love having you!! Pinned!! 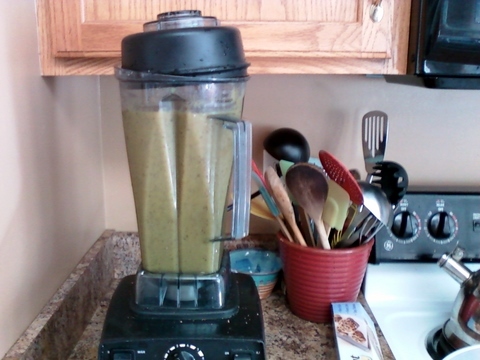 Can you use your blender for real food after using it for a garbage smoothie?